We’re all used to temperature controlled soldering irons, and most of us will have one in some form or other as our soldering tool of choice. In many cases our irons will be microprocessor controlled, with thermocouples, LCD displays, and other technological magic to make the perfect soldering tool. All this technology is very impressive, but how simply can a temperature controlled iron be made? If you’re of an older generation you might point to irons with bimetallic or magnetic temperature regulation of course, so let’s rephrase the question. How simply can an electronic temperature controlled soldering iron be made? [Bestonic lab] might just have the answer, because he’s posted a YouTube video showing an extremely simple temperature controlled iron. It’s not the most elegant of solutions, but it does the job demanded of it, and all for a very low parts count. He’s taken a ceramic housing from a redundant fuse holder, and mounted it on a metal frame to make a basic soldering iron holder into which the tip of his unregulated iron fits. To the ceramic he’s fitted a thermistor, which sits in the gate bias circuit of a MOSFET. The MOSFET in turn operates a relay which supplies mains power to the iron. Temperature regulation comes as the iron heats the ceramic to the point at which the thermistor changes the MOSFET and relay state, at which point (with the iron power cut) it cools until the MOSFET flips again and restarts the process. You may have spotted a flaw in that it requires the iron to be in the holder to work, though we suspect in practice the thermal inertia of the ceramic will be enough for regulation to be reasonably maintained so long as the iron is returned to its holder between joints. Nobody is claiming that this temperature controlled iron is on a par with its expensive commercial cousins, instead it represents a very neat hack to conjure a useful tool from very few components. And we like that. Take a look at the full video below the break. [Julez] wanted another soldering station, so he decided to build one himself using a Hakko 907 soldering iron (or a clone). Of course, he could have bought a station, but anyone who reads Hackaday doesn’t require an explanation for why you would build something you could buy. The station has two switchable outputs so you can use two different irons (perhaps with different tips) although you can only use one at a time. [Julez] bought a case with a transparent top from eBay and also got a digital temperature controller from eBay, which is the heart of the project. As for the actual iron, you can find clone versions of the 907 handpiece for well under $10. Because the station uses a module, the actual wiring isn’t terribly difficult. There’s a pot to control the temperature and the controller directly connects to the iron’s heating element and temperature probe. There’s also a standby switch that reduces the temperature using a fixed resistor in series with the control pot. 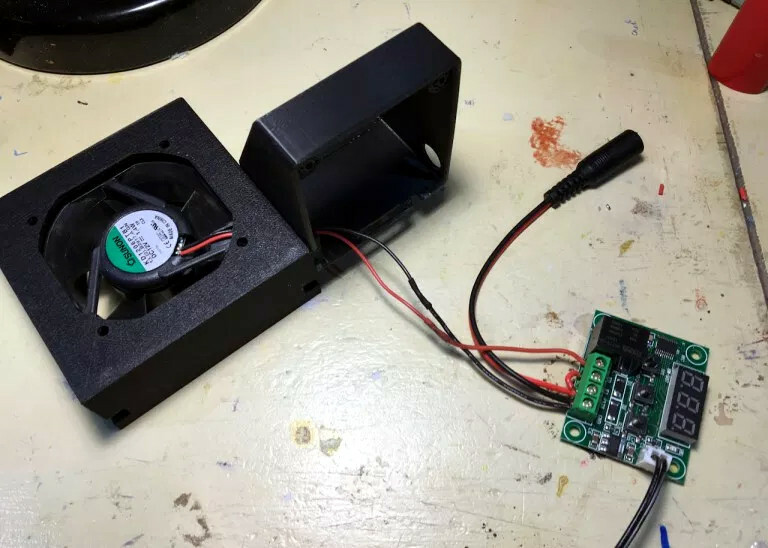 Any opportunity to shave a few bucks off your power bill is probably worth considering, especially if it’s a device like [Steve Hoefer’s] Mini Blind Minder. This little guy staves off (or welcomes) the sun by monitoring the room with a temperature sensor and checking against a setpoint. If the room is too warm or too cool, the top-mounted servo will spin the wand and close or open the blinds, respectively. [Steve] started by building a homemade Arduino shield from some perfboard to which he added a handful of discrete components: some current-limiting resistors for the RGB LED indicator light and a 10k trim pot for fine-tuning the temp sensor. Although this build forgoes an LCD readout to display precise information, it does provide feedback by stepping the RGB LED’s color through a spectrum of blue to red to indicate how the current room temperature compares to your setpoint. The two momentary pushbuttons beneath the light allow the user to adjust the setpoint up or down. See the video below for a detailed guide to building your own, and take a look at a similar automatic blinds build from earlier this year that opens and closes in response to ambient light. [Tim] is working on building a 3D printer and using it as an excuse to learn as much as he can. 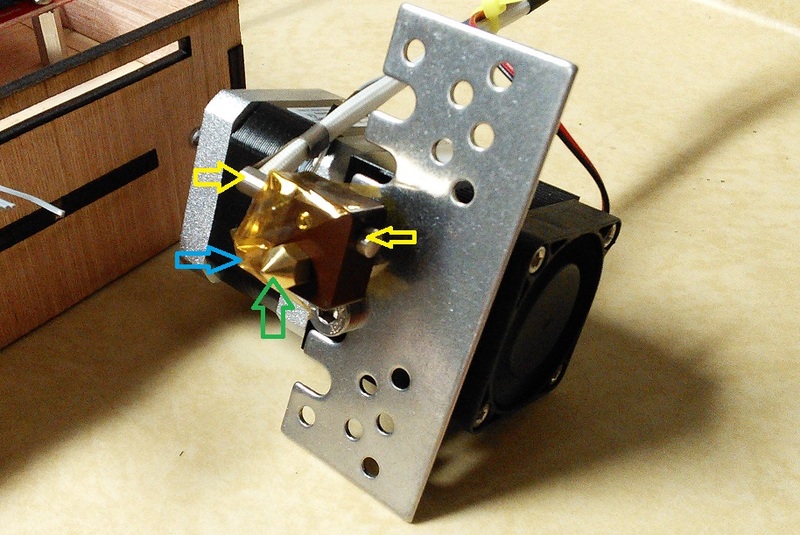 The first big issue he tackled was accurate temperature control, so he made an interesting write-up on how to characterize the thermal properties of an QU-BD extruder’s hot end and use that information to create a control algorithm for the heater. The article starts with a basic thermal model and its corresponding formula. [Tim] then runs several tests where he measures the heater and extruder tip temperatures while switching on and off the heater. This allows him to figure out the several model parameters required to design his control algorithm. Finally, he tweaked his formula in order to predict the short term future so he can know when he should activate the heating element. As a result, his temperature is now accurately controlled in the 200°c +/-1°c window that he was shooting for.